The Pennsylvania Chapter of the American Planning Association (APA) has awarded the Planning Excellence Award for Public Outreach to the Chester County Planning Commission for its Pipeline Information Center. 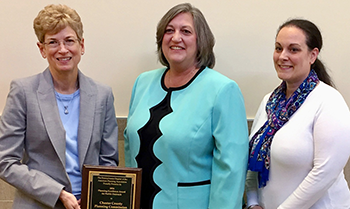 Chester County Commissioner Kathi Cozzone and representatives from the Planning Commission accepted the award at the APA’s recent annual conference in Allentown. At the awards event, the APA noted Chester County’s efforts to provide a website for residents containing the latest information on active pipeline projects. The first if its kind in the state – and probably the nation – the Pipeline Information Center allows pipeline operators, government agencies, municipalities and partners to share information on each other’s activities. It also includes a county map, searchable by address, to give specific information to homeowners, and has an experienced planner available to answer public questions. The Chester County Commissioners announced the launch of the Pipeline Information Center (PIC) website in April 2014. It can be found at www.chescoplanning.org. The creation of the Pipeline Information Center website was the result of nearly a year of research, data gathering and stakeholder input gathered at public meetings, undertaken as part of the Pipeline Notification Protocol, led by the Pipeline Safety Coalition, with support from Chester County Government and East Brandywine Township. The Pipeline Notification Protocol was funded by a US Department of Transportation, Pipeline and Hazardous Materials Safety Administration Technical Assistance Grant. For more information on the Chester County Planning Commission, go to www.chescoplanning.org.